Different branches of philosophy are distinguished by the kinds of questions they treat: Metaphysics is concerned with what is, ethics and philosophy of value with what ought to be, logic and philosophy of science with what is knowable. Since important contributions have been made since the earliest times, the history of philosophy constitutes a fourth branch of the subject alongside the three just named. What unites the different branches of philosophy is a common commitment to disciplined thinking, even or especially when treating questions whose every aspect is doubtful and disputed. Questions are addressed by appeal to reasoned argument and the evidence of experience, without asking that anyone take anything on authority or on faith. In the study of philosophy, a good deal of time is therefore spent learning how to evaluate the arguments of others and how to construct arguments of one's own. 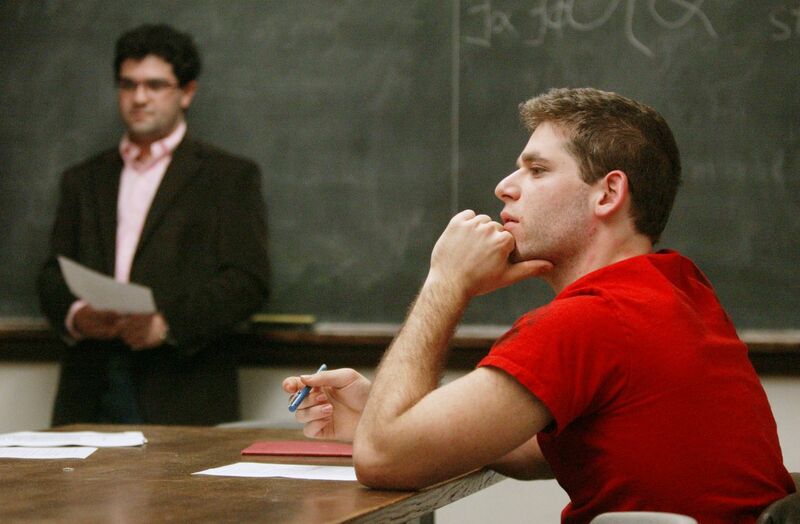 Princeton's philosophy department has consistently been ranked one of the top few in the country, and counts many scholars of international reputation among its faculty. It offers a diverse selection of courses from different branches of philosophy each semester, teaching historical material from original works in translation, and other material mainly from recent and contemporary scholarly publications. Thus it is possible for the student to acquire both a thorough grounding in the classics and an introduction to on-going research at the forefront of the subject. For concentrators, the regular option combines an expectation of substantial work on a diverse range of questions (at least two courses in each of at least three of the four branches of philosophy) with considerable freedom to pursue individual interests in independent work with faculty advisors; special options in interdisciplinary areas, such as political philosophy and philosophy of science, add flexibility by permitting the substitution of work in a relevant outside field for one area of philosophy. Since the opening of the first schools of philosophy in antiquity, many students of the subject have put their training in the analysis of argument and evaluation of evidence to work in a subsequent legal career; law schools have long recognized the value of an undergraduate major in philosophy. Increasingly other professional schools and employers have come to recognize it as well, and many of our recent concentrators have gone on successfully to work in medicine, journalism, business, or government. A few concentrators go on to graduate study in philosophy; those who do so generally achieve admission to top-ranked schools, with good fellowships. You can read about how some of our alumni came to major in philosophy and what they have done since leaving Princeton here. The American Philosophical Association maintains a comprehensive list of well-known people from diverse fields who began their careers by studying philosophy. Skills acquired by concentrating in philosophy can thus be useful for a variety of careers. But the main benefit lies in learning to think in an organized way about confusing and controversial questions; to treat one's beliefs as serviceable as they are but capable of improvement; to react to criticism not with outrage or fear but with a willingness to state the grounds for one's views and to listen to and learn from the views of others. These are habits of thought useful not only in a career, but in life.